In this post I wanted to show you the result of the Homemade smooth texture paste that I made from a recipe by Gabrielle Pallacco that I found on Pinterest (see Webster’s Pages Blog for original post). This recipe is just a mixture of talcum powder, white glue, acrylic paint and water. It is super easy to make and works wonderfully. 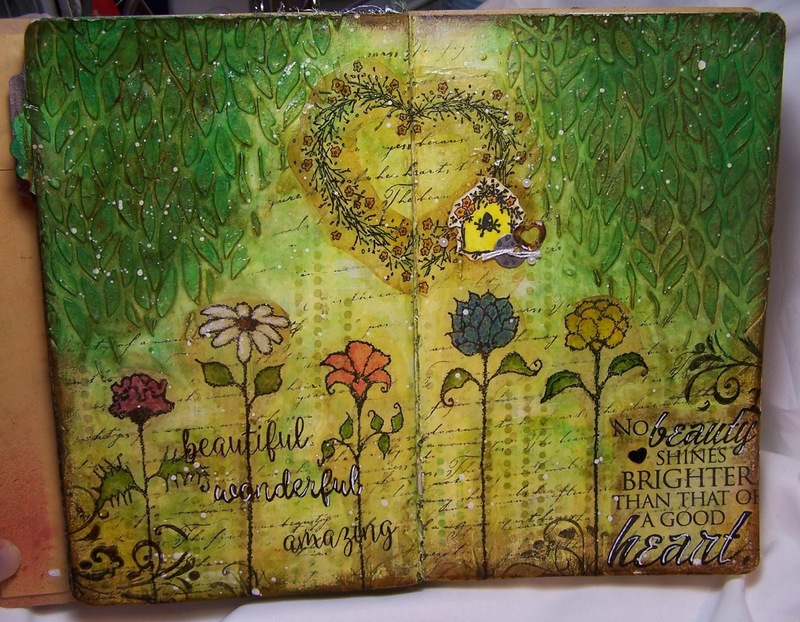 The texture paste was used below in the upper right and left corners of this art journal layout to create a leafy foliage element; that reminds me of leafy full trees. This whole page makes me long for warm summer days! I love the long stemmed flower stamps used here as well as the wispy heart wreath image (both from The Angel Company). To create this page I started with a coat of Gesso and then applied the smooth texture paste over a Dina Wakley leaf stencil by Ranger. I then built the color layers with a combination of Gelatos and spray acrylics/watercolors/glimmer mist. The focal stamp images were stamped with Archival Ink on tissue paper, colored, and then adhered to the page with Modge Podge. The background stamped layers were applied directly to the page with Archival Ink. I also added some additional interest to the page by applying Leaf Green Archival ink over the Pixelated stencil by Americana. Also, at different points in this process, I sealed the page with a Matte Medium to eliminate the loss of the different layers as I added a new dimension. Lastly, I used a Pitt artist pen, Dark Sepia, to create shadows on the page as well as around the edges. This smooth texture paste recipe was a great find and I really enjoyed using it on this layout. I hope you all try it and find success using it as well. Moroccan Spice – Club Scrap Inc.